Zahra Ahmad lawn dresses 2014 for women have also been released. 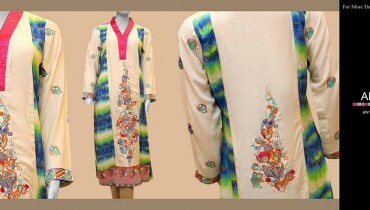 These lawn dresses are part of the summer collection of Zahra Ahmad and are totally fabulous. Lawn is one of the most appropriate fabrics for the summer season. Thus, we think that the lawn dresses being offered by Zahra Ahmad will keep you cool and comfortable. The lawn dresses contain mostly just shirts. There are unique abstract prints in this new collection of Zahra Ahmad. Digital prints are there on some of the shirts. The front and back of each shirt are different from each other. They will look good with trousers or tights. So, if you would like to have such dresses in your wardrobe, just go for Zahra Ahmad lawn dresses 2014 for women. Zahra Ahmad is actually the name of one of the largest brands for clothing in the country. The clothing brand deals in ready to wear stuff only. It provides various types of clothes in this category. The clothes of Zahra Ahmad include casual wear for all seasons as well as bridal wear and formal wear. Its last collection, i.e. Zahra Ahmad summer dresses 2014 was really different from this collection. It has shops in different parts of Pakistan. You can view the photos of Zahra Ahmad lawn dresses 2014 for women over here. You can see more of the stylish dresses of the collection through Zahra Ahmad’s Facebook page. You can get a list of all the outlets of Zahra Ahmad through Facebook page also. With that, you can easily find out where the clothes of Zahra Ahmad are available and go shopping or you can buy online.